Maya considers curves to be non-renderable geometry. 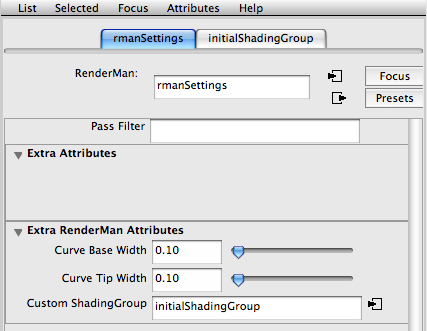 However, within the RenderMan for Maya (RfM) environment curves can be tagged as renderable ie. their CV's can be used to define RenderMan Curves. The tutorial "RfM: Maya Curves to Rman Curves" addresses a similar topic to this tutorial. 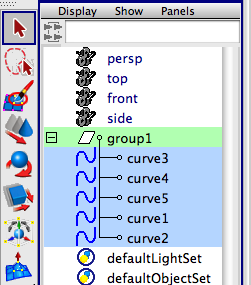 In order to render curves from Maya, using prman, or to export them as a Rib archive three attributes must be assigned to the shape node of each curve. If only one or two curves need to be rendered then each can be assigned the attributes individually. When many curves are involved it becomes necessary to use a so-called "Shared Geometric Attribute" (SGA). This tutorial demonstrates the technique of assigning a SGA to a group of curves. 1 In the outliner open the group node that "contains" the curves. 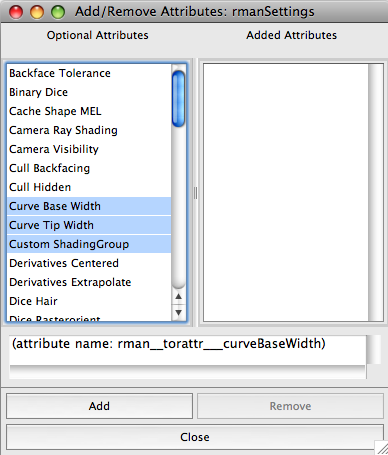 Shift + click to select the curves - figure 2. 3 Select the RenderMan tab on Maya's shelf. The RfM buttons will be displayed - figure 3. 4.1 Click the "SGA menu" button - shown outlined in yellow. 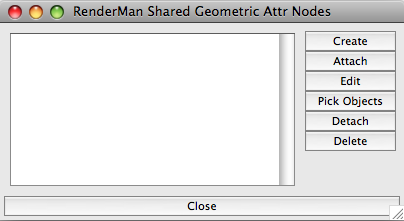 A window titled, "RenderMan Shared Geometric Attr Nodes" will open - figure 4.1. The buttons on the right of the window will be used in this order, "Create", "Attach" and "Edit". Click the "Create" button. 4.2 Click the "Attach" button, then the "Edit" button - the attribute editor will open with a tab labelled "rmanSettings" - figure 4.2. 4.3 From the "Attributes" menu choose "RenderMan->Manage Attributes" - figure 4.3. 4.4 From the list of RenderMan attributes choose those shown in figure 4.4. Click the "Add" button then close the window. 4.5 The three RenderMan attributes will appear in the editor. Only the values of the "Curve Base Width" and the "Curve Tip Width" will require editing - figure 4.5. The curves have now been tagged as renderable objects. They may be rendered directly using RenderMan Studio (ie. prman) or exported into a Rib archive file using Maya's "Export Selection..." menu.